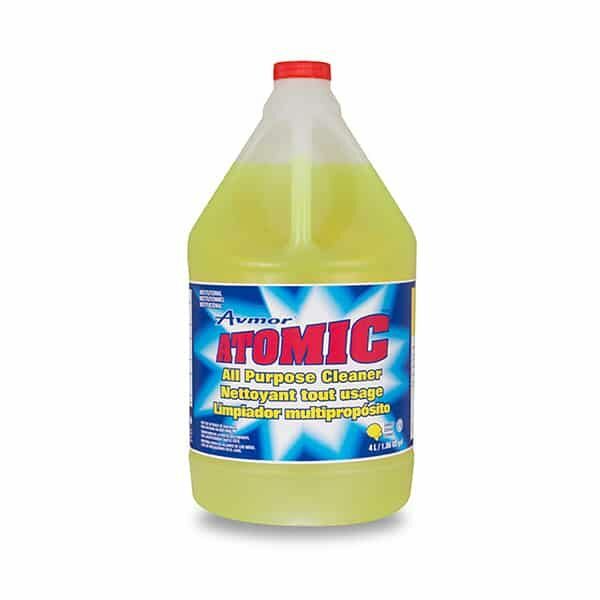 ATOMIC All Purpose Cleaner is ideal for industrial and institutional use. This product may be used to clean any hard surface; counters, walls, floors, doors, venetian blinds, painted surfaces, and more. Leaves a fresh lemon scent behind. FOR GENERAL CLEANING: Add 1/4 cup (60 ml / 2 fl oz) of product to 1/2 bucket of hot water. (No rinsing, no wiping dry required). FOR EXTRA TOUGH JOBS OR TOUCH UPS: Use straight from the bottle and rinse promptly. This product is not intended for rugs or upholstery, aluminum, glass or laundry.